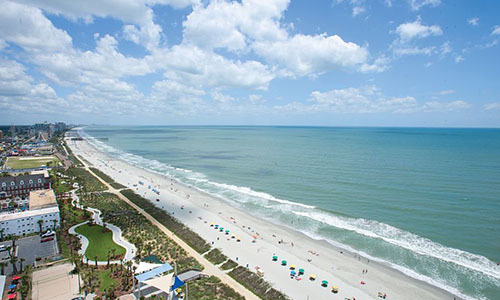 Planning your 2018 vacation getaway to Myrtle Beach, South Carolina, is important, especially if you want to stay and play at the best resort in town – Bay View on the Boardwalk. Located in the middle of all the action in downtown Myrtle Beach, Bay View on the Boardwalk gives you a front-row seat to the best things Myrtle Beach has to offer – the white-sand beaches and blue Atlantic Ocean; our oceanfront tanning lawn, splash pad, and indoor pool deck; and direct access to the famed Myrtle Beach Boardwalk. Guests can stroll straight from the resort property down the 1.2-mile oceanfront walkway to all the great attractions, shopping, dining, nightlife and more in the downtown district. * Accommodations: Bay View on the Boardwalk has more than a dozen different room styles and types, so booking early allows you to reserve the ideal vacation nest for you and your family. Enjoy a private balcony overlooking the ocean and clean, comfortable accommodations that are only steps away from the beach, pools and all the great downtown attractions. * Amenities: It's always summer at Bay View on the Boardwalk's heated, indoor pool deck. Featuring pools, hot tubs and a lazy river, as well as an outdoor splash deck and tanning lawn, Bay View offers guests a splashing good time year-round. Guests can also start their vacation day in style by visiting our on-site Starbucks Cafe. * Festivals and Events: One of the best reasons to book your Myrtle Beach vacation early is the opportunity to save a spot for some of the best festivals and events of the year. Plan your trip for the North Myrtle Beach St. Patrick's Day Parade (March 17), Monday After the Masters Pro-Am (April 8-10), Myrtle Beach Bike Week Spring Rally (May 11-20), the Carolina Country Music Fest (June 7-10) and for the biggest celebration of the year – the Fourth of July. You can rest easy knowing your vacation plans are in the books. * Sports: The Grand Strand is like one big playground for sports fans and outdoors lovers, from golf and fishing to the Myrtle Beach Marathon and the Salt Games. The spring golf season heats up in March, with more than 80 courses in the area offering rounds on award-winning layouts. The Myrtle Beach Pelicans minor league baseball team plays ball from April through September, Coastal Carolina University plays top-level football in the fall, and the Beach Ball Classic closes out the annual sports calendar the last week of every year. * Sun & Fun Rewards: But wait – there's more. For all the fun in the sun in store for your stay at Bay View on the Boardwalk, we've also gone the extra mile by offering our guests a free Sun & Fun Rewards packet that includes free passes and discounted tickets to some of the top entertainment venues in town. Guests also receive free and unlimited access to our vast collection of DVDs, all just for staying with us. So what are you waiting for? Get your 2018 vacation plans together and lock in your trip to Myrtle Beach and Bay View on the Boardwalk today!